The Japanese Spitz is a member of the beautiful and natural Spitz group of dogs. Spitz breeds are one of the oldest groups of dogs and they share many characteristics, including triangular-shaped heads with small, erect pointed ears and pointed muzzles. Generally, Spitz breeds will also have a thick, double coat and a tail carried over their back. All Spitz possess a mixture of great loyalty, charm, courage, stubbornness and independence. The Japanese make claim to the origins of the Japanese Spitz, however there is evidence of white spitz-type dogs in other countries dating back hundreds of years. There were many medium sized Spitz breeds in Europe, especially Germany and Russia, and these were predominantly white. During the late 1800’s it can be seen that this type of dog began making its way to America. During the early 1900’s, white Spitz appeared in Japan – possibly due to the movements of armed forces and their families in and out of Japan, China and Russia from America and Canada (with settlements established in Manchuria) who also traveled with their pets. Today’s Japanese Spitz was developed in Japan by dedicated fanciers between 1920 and 1950. Early specimens were exhibited for the first time in Tokyo in 1921 culminating in the writing of the first breed standard in 1953 (note – due to the war the Japan Kennel Club was not founded until 1948). The first breed Club was then formed in 1959 – the Nippon Spitz Association. The breed arrived relatively quickly in Australia. The first exports from Japan arrived in Sweden in 1973, then the first imports into England arrived from Sweden in 1977. Breed fanciers in Australia were fortunate enough to import progeny of those early arrivals in England and as a result the breed arrived on our shores in 1980. The first litter in Australia was born on 9.12.1981. Many imports have followed, mainly from England, Sweden and Italy. The Japanese Spitz is an attractive dog with a profuse off-standing coat of the purest ice white, contrasted by black eye rims, lips and nose, and dark expressive eyes. They have an alert appearance with pointed ears, wedge shaped head and well plumed tailed carried proudly over their back. They possess a firm strong body that is full of flexibility, a sturdy dog with no toyishness. The height to length ratio is 10:11. The standard of the Japanese Spitz calls for moderate angulation. Bone is moderate also as fine bone would negate the strength required, while heavy bone would give a cloddy dog, losing flexibility and agility. The ideal height is between 13.5 and 14.5 inches for males and between 11.75 and 13.5 inches for females. The Japanese Spitz is quick and cheerful in its motion, beauty in rhythmical and light steps. Light and nimble, active, energetic and very smooth in it’s action. A well made Japanese Spitz moving purposely demonstrates a fine economy of effort, gliding along in an effortless fashion. Japanese Spitz are a family dog. They are an intelligent breed always eager to please, having being developed purely as a companion dog. They enjoy living both indoors and outdoors, in fact they enjoy being wherever you are – they thrive on human companionship. They are fairly protective of their surrounds as well. They can be wary of complete strangers approaching them without formal introduction – they prefer a gentle approach, after which you have a friend for life. They do not need lots of exercise, but they are an active breed and enjoy regular walks. If they are bored they can be a little mischievous, so they are not a dog to be left in the back yard and forgotten. Japanese Spitz do live happily with other pets once introduced responsibly. They do however possess a dominant nature and will quickly become the “boss”, so a firm but fair consistent approach is needed in training. You will be rewarded with a loyal and devoted, affectionate and intelligent member of the family. They are adaptable to any circumstance. 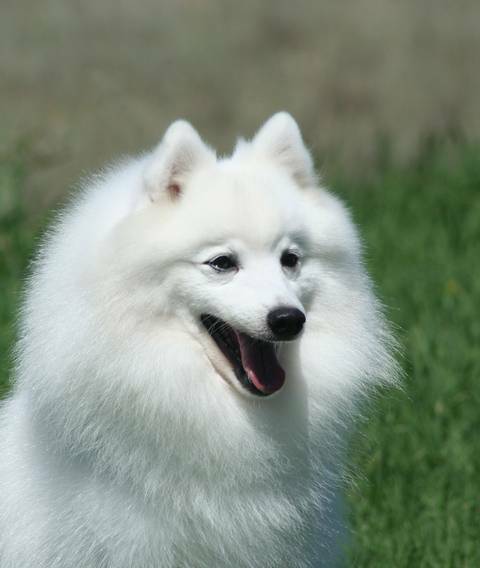 Despite its long pure white coat the Japanese Spitz is a relatively low maintenance breed. Contrary to most peoples’ expectations, their coat is easy to look after. Due to the coat’s soft texture, mud and dirt will fall off or can be easily brushed out. While they may love to play in the dirt, this is a fastidious dog that will lick itself clean, like a cat. They do shed their coats once a year for males and twice a year for females. The hair is easily brushed out and the shedding will last about 2 weeks. For maintenance it is recommended that Japanese Spitz have a thorough brush every week and a bath about once a month. They are typical of most Spitz breeds where the coat does not have a doggy odour and is quite sweet smelling. With regular grooming, you will be rewarded with wonderfully attractive dog with a sparking white coat. assessed by a Veterinarian in both puppies and adults, and registered breeders are conscious of this and should strive to eliminate this weakness form their breeding programs. Some Japanese Spitz may also suffer from tear staining. This can be caused by a number of issues, from blocked tear ducts to a rounder eye shape. There are a range of treatments, from where the tear ducts can be cleared by a vet to daily eye wipes. The Japanese Spitz is achieving medium popularity as a family pet. His sparkling white coat is more easily maintained than it may first appear. Having an odourless coat and being fastidiously clean, they have been described as a cat-like dog. They are intelligent, extremely agile and light on his feet and can lend themselves to many different pursuits including agility, obedience, therapy dogs and of course very attractive show dogs. As a companion, the Japanese Spitz simply enjoy being with their owners – whether curled up on a lounge or walking in the great outdoors.